Share this report with your city’s leaders. Tell them that cities can create good and safe recycling jobs by ensuring health and safety compliance across the industry. Recycling is the right thing to do, but we need to make it safe for recycling workers. Recycling is a key approach for waste reduction and climate action that is used by cities across the U.S. with enormous environmental and economic benefits. But a new report finds that the actual work of sorting recycling can be unnecessarily hazardous to workers’ health and safety. Seventeen recycling workers died on the job between 2011-2013, and recycling workers are more than twice as likely to be injured on the job than the average U.S. worker. These high injury and fatality rates are a result of unsafe working conditions including exposure to hazardous items on the sort line, like hypodermic needles, toxic chemicals, and animal carcasses, and working around heavy machinery. By ensuring health and safety compliance across the industry, cities can protect workers who protect our planet. Cities have the power to create good and safe jobs by contracting solely with responsible recycling companies that maintain rigorous health and safety programs. Municipal best practices also include prohibiting the use of temporary employees — who are at the greatest risk of injury on the job — and educating communities about correct separation of recyclable materials. Additionally, unionized workers enjoy more effective enforcement of these mandated health and safety protections. When workers have a voice on the job and protection from retaliation, workplaces are safer, have well-trained staff, and experience less turnover than nonunion workplaces. “Safe and Sustainable Recycling” is being released by local partners: Boston, New York, Los Angeles, Atlanta, San Diego, Milwaukee, Newark, Baltimore, Oakland. 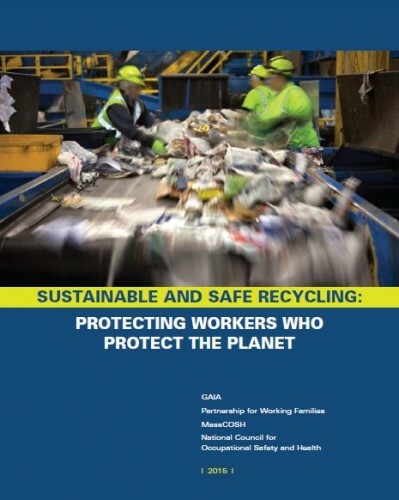 The report is by GAIA, Partnership for Working Families, and National Council for Occupational Safety and Health.